Many youth attended the rally May 26, an increase from numbers at earlier demonstrations. Whirlpool long ago closed its plants in Benton Harbor, depriving residents of their main source of jobs, and then seized publicly-owned assets, with the help first of the state’s Emergency Manager law, then with the continued collaboration of “elected” officials. Pinkney was targeted as he led a campaign to recall the mayor. Prosecutors produced no evidence that he had altered several dates on a recall petition, but an all-white jury convicted him anyway. 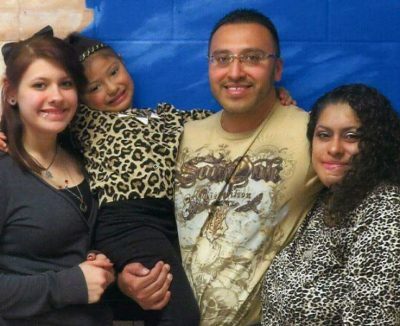 He was sentenced to 2.5 to 10 years in prison, but was released after the Michigan Supreme Court ruled that he had violated no law. Speakers at the rally included family members of two young men murdered by Berrien County police in 2016, Martell Walker-Hadley, 26, and Darius Wimberly, 28. Walker-Hadley’s mother LaDona Walker-Hadley addressed the crowd demanding justice for her son, who died Feb. 27, 2016 at the age of 26 in the Benton Harbor jail. Police alleged the father of a two-year-old son hung himself after he was arrested for “fleeing and eluding” police, and sentenced to one to two years in prison. But the family insists that Martell was murdered. His mother noted that a second autopsy showed he had blunt force trauma to his chest in addition to the presence of suspicious chemicals in his system, not consistent with the official autopsy results of “asphyxiation. They have established a GoFundMe page for Martell at https://www.gofundme.com/dvrvtmhw. 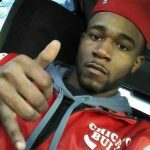 Darius Lamar “Karate” Wimberly, 28, was killed Oct. 18, 2016 by Benton Harbor police, who alleged he fired at them, on Pavone St., only a block away from the site where Benton Harbor youth rose up against police killings in 2003, carrying on a rebellion for three days. 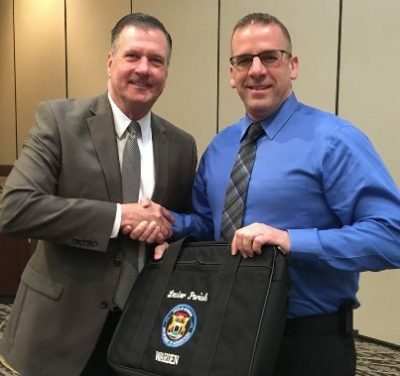 Berrien County Prosecutor Michael Sepic cleared the cop who killed Wimberly. Sepic also prosecuted Rev. Pinkney and has recommended that all 100 of Berrien County’s “juvenile lifers” be re-sentenced to life without parole. Sepic and most other county prosecutors in Michigan are thus in violation of two Supreme Court rulings outlawing juvenile life without parole as unconstitutional. Wimberly’s mother spoke at the rally, saying neighborhood residents wanted to rise up again after police killed her son, but that she asked them not to do so because police would kill others. She said although police claimed Wimberly fired two guns at them, there was no gunshot residue on his hands. Rev. 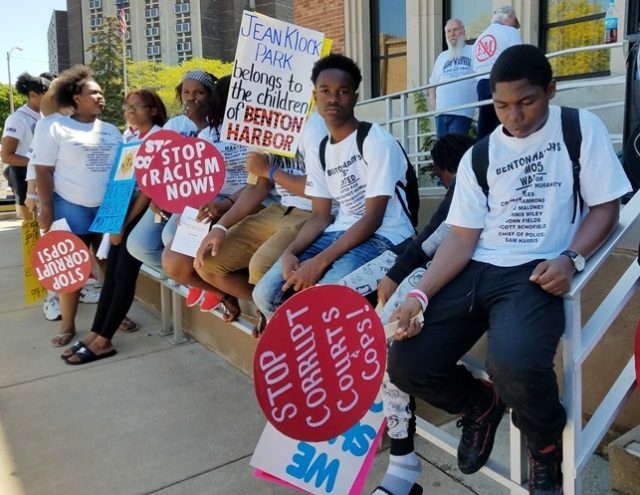 Pinkney addressed the ongoing police war against the people in Benton Harbor, including drug frame-ups of 300 men and molestations of 20 women in the city, as seen below. A speaker from Chicago said that so-called “gang” members are trying to come together there in order to stop killing each other and direct their anger at the forces that are impoverishing Black and Latin neighborhoods in Chicago and throughout the country. 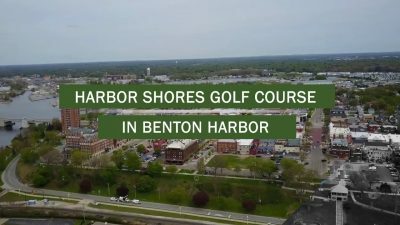 The crowd then began a silent march led by a coffin symbolizing the death of Benton Harbor, but were immediately turned back by Berrien County and Benton Harbor police at every access point that would have led to the golf course. In 2012, Pinkney led the march through the city’s streets all the way to the gates of Harbor Shores and the golf course. BELOW: SPECIAL VIDEO PRESENTATION BY MAC SPEAKING. Video recorded on Saturday, May 26, 2018 during the “Occupy The PGA – Mass Demonstration: To Save Our Children” Rally and Silent Walk event, featuring Rev. Edward Pinkney (Civil Rights Leader, former Michigan Political Prisoner), Minister Kuhgangah Ashe’ (Human Rights Activist, United Nations), David L. Lowery, Jr. (Founder, Living and Driving While Black Foundation, Inc.), LaDonna Walker (Mother of the late Martell Walker Hadley), Ayanna Johnson (Mother of the late Darius L. Wimberly aka “Karate”), Ralph Poynter (Civil Rights Activist, and Widower of the late Attorney Lynn Stewart), George Lyons (Attorney at Law), Juanita Henry (Commissioner, Benton Harbor, MI); and others at Benton Harbor City Hall located in Benton Harbor, MI. Below, Efren Paredes, Jr., one of the county’s juvenile lifers who is a leader of Juvenile Lifers for Justice and was arrested in Benton Harbor at the age of 15, recounts his recent experience at Oaks Correctional Facility. OP ECF 05.03.115 “Use of Law Library by General Population Prisoners,” authorizes librarians to grant additional time to prisoners to conduct legal research who are within 60 days of a verified court deadline. I provided a court order to the librarian verifying that I have a pending court hearing scheduled within that timeframe. In my request for additional research time I stated that a great deal of my legal research involves reading dozens of peer-reviewed law journal articles regarding adolescent development, fMRI brain imaging studies, and other mitigating factors related to my upcoming resentencing hearing. There are hundreds of these articles I need to review in a short span of time which is an impossible undertaking given the time I am currently authorized to conduct legal research in the law library. I pointed out that I have paid to have several of the peer-reviewed journal articles photocopied so I can read them in my cell but cannot afford to have them all reproduced. This was the reason I was requesting additional legal research time. Though I was authorized to receive two additional hours a week it will be insufficient to conduct all the necessary research before my next scheduled court hearing. The articles I need to research frequently exceed 30 pages in length (sometimes up to 70 pages) and I am often unable to read an entire article during a single two-hour law library session and take the necessary handwritten notes which itself is a time-consuming task. I even offered to provide her evidence of the many pages of notes I have already taken from the articles I read each week. I am currently being limited to six hours of legal research per week to prepare for arguably the most important court hearing of my life. [Efren is referring to the “mitigation hearing” he and others who face prosecutor’s revived recommendations for LWOP]. My request for additional legal research time was for two additional hours during regularly scheduled hours on the weekend which would not have prevented other prisoners from using any of the available computers. 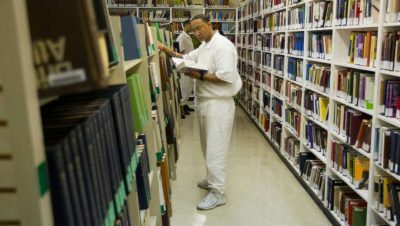 The law library has 15 computers available for prisoners to conduct legal research with which provide access to LexisNexis, a legal research portal. Less than a third of the computers are used at any given time when Level II prisoners are permitted to use them. The notion that allowing a prisoner to use one of the idle computers for legal research triggers a “custody and security concern” is delusional and absurd. More than double the number of Level IV custody prisoners use the law library computers than the number of Level II lower custody prisoners for legal research each day during their scheduled time and it is not deemed a “custody and security concern” by custody staff or the Warden. Since Berean’s reasoning for her denial is obviously false and baseless it begs the question: what was her true motive? Berean’s distorted reasoning for denying my request to be granted additional legal research time is arbitrary and a clear abuse of authority. It is divorced from reality, illogical, and provides a snapshot into what she thinks about prisoners using the law library to conduct legal research. It also demonstrates she may be ill-equipped with the temperament, social skills, or decision-making capacity to properly fulfill her job duties. Warden Lester Parish at right. Even other staff members agreed that her decision to deny me additional research time was irrational. Her actions stain the image of the Michigan Department of Corrections (MDOC) and interfere with prisoners’ rehabilitation. When MDOC staff members subvert policy and devalue prisoners’ lives they send a chilling message that their future is devoid of meaning. There is little wonder why prisoners often return to society frustrated, demoralized, and battling anxiety having been forced to endure the exhausting experience of repeated instances of staff engaging in microaggressions and abusing their power. Since his recent arrival at ECF Warden Lester Parish has laudably begun transforming the culture of the prison from its shameful past of mismanagement and hostility toward the prisoners in its care to a culture that promotes the MDOC’s vision and values policy. Staff members like Berean threaten to destabilize this progress. Her actions are evidence of a belief that prisons should be monuments to punishment and exclusion which contravene the Warden’s proactive efforts. This episode is only one among the many examples of unfortunate challenges prisoners are forced to deal with as they navigate the minefield of staff abusing their power in prison daily life. Fabricating unreasonable excuses to obstruct a prisoner’s access to the courts rises to the level of a civil rights violation. Sadly it is not the first time a prisoner has been compelled to challenge similar injustices in federal courts. There is a long history of prisoners litigating against MDOC staff members for their refusal to recognize fundamental constitutional rights. In a civil suit recently filed by a prisoner challenging a violation of his constitutional rights by an MDOC employee a federal judge ruled that MDOC staff members are not impervious to civil litigation because they simply claim immunity. The court added that staff members are not able to enrobe themselves in an absolute shield against legal action brought against them for violating constitutionally protected conduct. Unfortunately it is taxpayers who keep bearing the burden of paying the costs associated with litigation resulting from the obstinate behavior of prison staff members who are allowed to engage in unconstitutional behavior. The moment taxpayers refuse to continue paying for their misdeeds it will change their behavior. When state employees begin paying their own legal fees to defend themselves for offending protected constitutional rights they will become less impetuous to entertain their darker impulses. It is a prospect taxpayers should consider exploring. Great demonstration in Benton Harbor last Saturday…Whirlpool is not good for this city . And condemningjuvenile to life is just plain wrong.